Everything a junior swimmer needs to know about swimming training and competition is now available for your child. 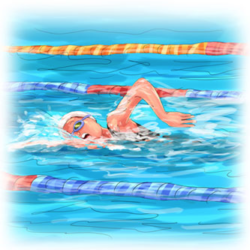 Competitive swimming is a fun sport and thousands of juniors take up swimming each year. For many families, the regular training sessions and swim meets are a new way of life. While swimming parents have benefitted from reading Swimming for Parents, the world’s leading resource for parents of swimmers aged 8 to 14 years, now it is the swimmer’s turn. There is so much to learn about swimming, particularly as a young person. To help every junior and age group swimmer get ahead of their competitors, Behind the Goggles provides young swimmers with everything they need to know about the sport of swimming. 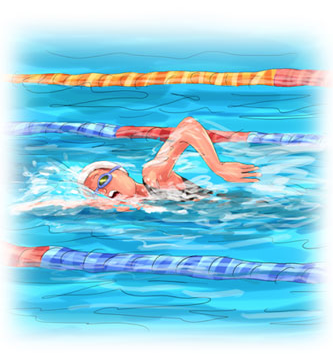 Work hard at practice… do what your coach asks you to do and swim with correct technique all the time. Race in swim meets on a regular basis… this will build your ‘racing’ confidence. Practise managing yourself really well…make sure you get enough sleep and that you eat well around school and swimming. Reward yourself when you are successful…if you do something really well, do something to celebrate your success. Keep a log book or diary of what you have done well. Keeping a log of your good training sessions or races and looking back through it will help you to develop self-confidence. These tips and hundreds more are provided in an easy to read format. With colourful cartoons, swimming tips and swimming quotes, every child will fast-track their knowledge and performance by reading this book. Why swimmers get disqualified and what can they do about it. Young children can read parts of the book where they want some help or read all of it at once. For example, if they read the book first, they can then refer back to it over and over again. eg. If they have a swim meet coming up in 3 months, they can look at what they need to focus on 3 months before the meet, 1 month before, the day before and on the day. Behind the Goggles is a great gift for junior swimmers aged 8 to 14 years and has been written and designed for an international market.